Mika Tajima is a New York–based artist whose latest project, The Architect’s Garden, is on view until December 17 at the Visual Arts Center at the University of Texas at Austin. Tajima’s site-specific installation is accompanied by a program of events, including a conversation she had with Richard Linklater, director of the 1991 film Slacker. Her latest body of work continues to excavate the social implications of contemporary built environments, and the concomitant development of particular kinds of human performers, such as the flaneur, the slacker, and the good worker. I DON’T GO TO HOME DEPOT A LOT, but I recently went to the paint section looking for two specific colors, a royal blue and a rusty brown. It’s an easy place for me to select industrialized mixed colors and coincidentally complements the idea behind The Architect’s Garden. The experience of picking colors is bound up in the brand’s dreamy affects—the Ralph Lauren Collection or the Martha Stewart Collection—and reading all the evocative, predetermined color names. One of my favorites was Soul Sister, which is a deep purple, and there’s one called Lion Heart, which is a soft yellow. 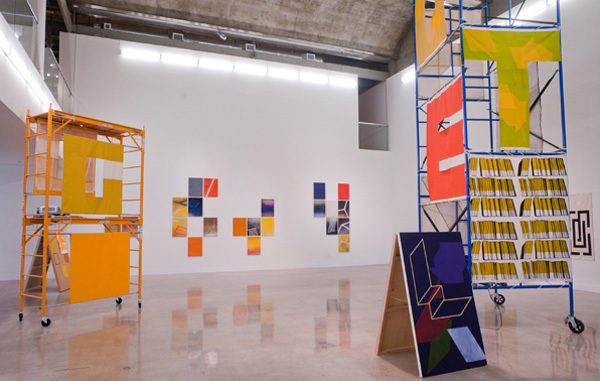 The exhibition includes an ongoing series of spray-painted Perspex paintings linking visual abstractions to geographic locations—smoky gray and sunglow orange in Furniture Art (Malmo), or banana yellow and gold in Furniture Art (Belize City)—projections of those places, taking you there. I’ve been thinking a lot about Richard Linklater’s Slacker, which was made in Austin twenty years ago. When I was growing up in Austin, the local resistant figure was, and maybe still is, the slacker. The slacker––not to be confused with involuntary underemployed––makes self-determined choices not to do something—to refuse or strike with little effort. For me, the psychogeography of the film is the polar opposite of an overtly structured environment, like Herman Miller’s Action Office, the first designed cubicle spaces in which work and social interaction were organized to control/produce life’s abstractions. The figure of the slacker is a critique of those systems that regulate bodies and space. It represents the potential possibilities around or at the edges of these regulated places and logics. Slacking is nonperformance in the face of post-Fordist total life. By making space for nonprescribed functions in The Architect’s Garden, I’m trying to create a structure for slacking. Similarly, in my previous work a painting becomes a double-sided bulletin board, or another architectural element, skirting an object’s normal role or adding other purposes—productive or not. Slacking is a mode of refusal. Perhaps the best representation of the slacker painter is the monochrome.